We must moderate the amount of time we spend on our smartphones. Bright rectangles reflecting in the summer sun are not what sophomore summer is, but that is often how it appears. Smartphones bulge in students’ pockets, bringing many unique advantages and disadvantages. Smartphones bring unprecedented communication and coordination, which is useful in a term rife with so many activities. However, the irony is that students spend inordinate amounts of attention not on the world they inhabit, but rather the small rectangular prisms residing in their pockets. Smartphones have revolutionized the college campus. People can plan to meet other people without either person meeting beforehand. The advantages of the smartphone are so obvious, so quotidian in the details, that these advantages were digested long ago as the normal state of affairs. Anyone who believes that the ubiquity of the smartphone on college campuses is normal is correct. 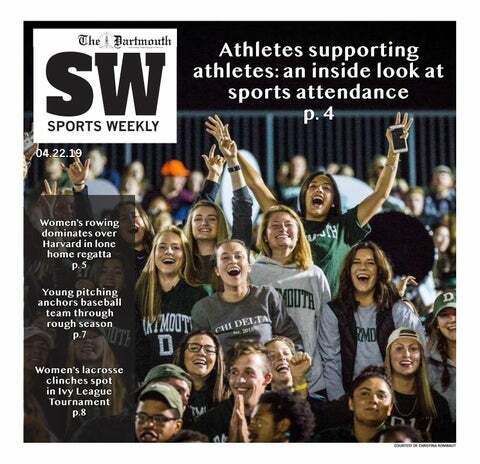 The amount of aggregated online content per day at Dartmouth must be incredible; the proportion of which is vapid content is equally astounding. Smartphones enable and encourage indolence. Spending free time in one’s room is no longer a way of disengaging from the world, but instead an opportunity to stare at a small screen for hours. In that time one could possibly be witty in a group chat, peruse social media, curl the smallest of smiles at a meme—if it is truly that humorous and merits an actual physical response—or commit any of the series of taps necessary to reach another source of entertainment. There is nothing inherently wrong about spending time away from others. The problem lies in the unnecessary prolongment of solitude, where one is easily seduced by the glowing screen for far longer than necessary. Smartphones are omnipresent in our daily lives, actively in use irrespective of our location or social interactions. The longest a Dartmouth student may be without his or her phone is when they use it to reserve a spot in the dining hall or library. Coordinating activities with a smartphone is one taking advantage of the benefits of living in the 21st century, but communicating with people other than those you are with is nonsensical abuse of that privilege. What is the purpose of being friends with someone if you are rarely with them? Whether it be in a fraternity late at night, or across a table laden with food, we are all guilty of paying our phones too much attention in the company of friends. Our little rectangles are dangerous conversation killers. It is far too common to take refuge in a smartphone when small talk has been exhausted, than it is to go beyond the discussion of hometowns, majors, extracurriculars and interim experiences. One result of the omnipresence of smartphones is the possibility of recording events. Recording one’s experiences is an excellent way to reflect. However, it can also negate the power of the meaningful experience. Actors in a movie are who we see on screen, not the people behind the cameras. Curating a life online is perfectly fine so long as it doesn’t determine how you live your life in the world. The sea of iPhones at concerts, or slew of posts on Instagram this Fourth of July, are just a few examples of our modern-day conflation of frequently boasting about activities without truly taking enjoyment in them. The proliferation of cracks across iPhone screens bears testament to unwarranted use. No device is used more per day than one’s smartphone. Strangely, this does not result in behavior that seeks to protect these devices. Cases are common, and not the simplest solution. Our phones are fragile devices liable to be dropped infrequently—protecting for that eventuality is not foolish. However, venturing into the night, having coordinated with friends to meet up with your smartphone, meeting with them and recording incessantly with your smartphone, reaching your destination and continuing to record while also consuming the recordings made by other people on their smartphones, is gratuitous. It is fun, and it is the reality of modern socialization, and yet dangerous, and not just dangerous for pristine screens. Augmenting memories by using a smartphone to record one’s life is to take advantage of the marvels of technology. All you need to do to understand that marvel is to turn Wifi off and set your phone on airplane mode. It is remarkable how habitual smartphone usage is proven to have been if one conducts this simple experiment. The urges to check social media, Snapchat, and texts generally go unnoticed because they are automatic. One doesn’t think to do these things, one does them. This is of course a ridiculous experiment because phones are valuable tools. To forgo their use entirely is as nonsensical as using them ceaselessly. We must find a middle ground after thoughtfully considering our possible addiction to this rectangular prism.